In 1984, five new "Kukiya" transport aircraft landed in Sde-Dov AFB. It was only years later that the IAF revealed that it had integrated the aircraft, and it took a long time before its true mission was revealed. What is the story behind the force's most mysterious aircraft? 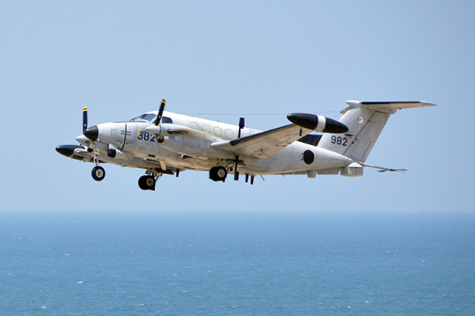 For years, the story behind the "Kukiya" (Beechcraft King Air C-12) aircraft's service in the IAF was kept hidden, with only a few people aware of the truth behind the mystery. 12 years passed from the moment the aircraft arrived in 1984 and to the moment its use was first reported in media outlets around the world – even then, details were only partially revealed. "Since 1984, the IAF has utilized several 'Kukiya' aircraft in detection of ejecting aircrew members and special reconnaissance missions", according to a 1996 edition of the IAF Magazine. "The 'Kukiya' operates optimally in long-range flight, and its two engines allow it to operate safely, especially in flight above water." However, these are not the aircraft's only capabilities. What is the story behind the long-serving mysterious aircraft? The IAF Site provides you with the secrets behind the "Kukiya". A peace accord was signed between Israel and Egypt in 1979, and was completed when Israeli forces pulled out of the Sinai Peninsula in 1982. With the 1973 Yom Kippur War still fresh in their memory, IDF service members and government officials were concerned about the evacuation of IDF outposts in Egypt, and began thinking up potential solutions. "The 'Kukiya' was a project led by members of the IDF Military Intelligence Directorate, as they were the dominant force in the field", said Lt. Col. (Res') Yuval Lotan, who served as the squadron's commander at the time of the aircraft's integration. "As part of our agreement with the Americans, who led the peace process, they allowed us to develop the project - state-of-the-art reconnaissance systems integrated in the aircraft - with them. In the beginning, the "Kukiya" had unfulfilled potential. "We had intelligence aircraft in the force before, but only utilized them partially. After the 'Kukiya' was integrated, we had five aircraft unlike any other in the world with systems that nobody else had. The aircraft had no instruction manuals, and we had an American test pilot teach us everything because there was no written material", recalled Lt. Col. (Res') Lotan. "We started planning up instructions on how to operate the aircraft alongside intelligence service members, and soon began performing training flights", added Lt. Col. (Res') Lotan. "In the beginning, the aircrew members piloting the aircraft and the intelligence personnel weren't in touch with one another. As pilots, we had no idea what the intelligence service members' responsibility was, but we quickly realized it would not work that way and that we needed to learn about their operation. This was a cooperation between two forces, and the integration process was unique". Operation of the "Kukiya" was more expensive than the operation of other transport aircraft, which meant that it was unclear when the aircraft would begin to participate in operational scenarios. "One evening in the beginning of 1985, I received a phone call from the Military Intelligence Directorate saying that two IDF soldiers had been kidnapped in Lebanon, and that we had to send in two aircraft in order to find them. With no preparative infrastructure and midway through the integration process, we had two aircraft in the air non-stop for an entire week", said Lt. Col. (Res') Lotan. "By the end of that week, the squadron had managed to prove itself operationally. We jumped right in the deep end". The original goal was to never reveal the aircraft's existence. However, seeing as the United States has to report whenever it sells its weapon systems to foreign countries, the "Kukiya" was exposed to the public. Years passed until the aircraft's intelligence operations were revealed, and many of its missions remain clandestine to this day.